Some brand new, action-packed footage from Pacific Rim 2 has arrived online. Legendary Pictures has released a featurette with a ton of new behind-the-scenes moments, in addition to bits of telling new scenes from the highly-anticipated sequel. We get to see some of the new Kaiju set to threaten Earth in Pacific Rim 2, in addition to the revelation that Jaegers are going to be squaring off with one another in the movie. "Join Pacific Rim Uprising stars John Boyega, Scott Eastwood, Rinko Kikuchi, Cailee Spaeny and director Steven S. DeKnight on a journey behind the scenes of this epic global production. Discover an explosive ||new world of monsters and mechs, and meet the new generation of heroic Jaeger Pilots born into the aftermath of the Kaiju war." The Pacific Rim: Uprising featurette made its debut at Tokyo Comic-Con 2017 and Legendary made sure to impress those in attendance. The video is a blend of interviews with the cast and director Steven S. DeKnight, looking at how the movie was filmed and some choice bits of new footage that hasn't been shown off in previous trailers. For one, we get a much better look at one of the biggest new Kaiju from the sequel, which looks to be quite destructive. That aside, it also looks pretty awesome. Though, it's really the final shot of the trailer that will raise some eyebrows. Two Jaegers, the giant robots that are supposed to protect Earth from the Kaiju threat, are fighting one another. We have little context, so it's hard to say why this is happening, but it's a very cool shot. Pacific Rim: Uprising centers on Jake Pentecost (John Boyega), a once-promising Jaeger pilot whose father, Stacker Pentecost (Idris Elba) gave his life at the end of the first movie in order to save the world. Jake has abandoned his training in favor of a life in the criminal underworld. 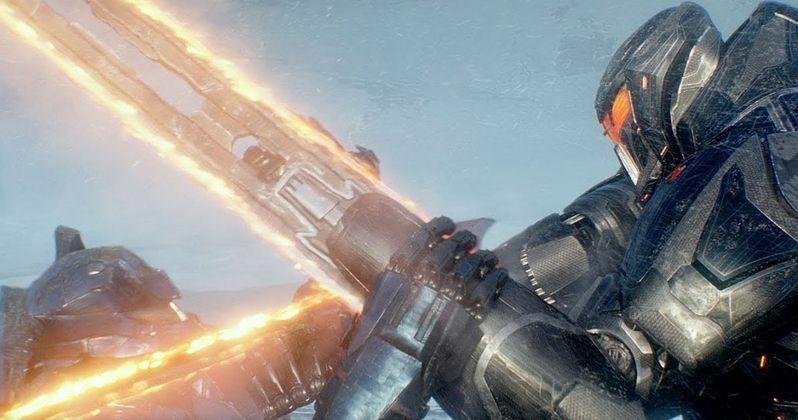 But when an even more unstoppable threat is unleashed to tear through the world's cities, he is given one last chance to live up to his father's legacy by his estranged sister, Mako Mori (Rinko Kikuchi), who is leading the charge with a new generation of Jaeger pilots that have grown up in the shadow of war. Their only hope is to band together in a global uprising against the Kaiju. Unfortunately, Guillermo Del Toro, who directed the first Pacific Rim, didn't return this time around, but he still serves as a producer on the sequel. Pacific Rim 2 is set for release on March 23, 2018, making it one of the first major blockbusters to hit theaters next year. The movie was originally slated to arrive on February 23, but the studio decided to bump back the release by a month. Be sure to check out the brand new Pacific Rim: Uprising featurette, courtesy of the Legendary YouTube channel, for yourself below.